Are you ready to take advantage of new technology? As the backbone of your organization, your ERP system touches every department in some way. 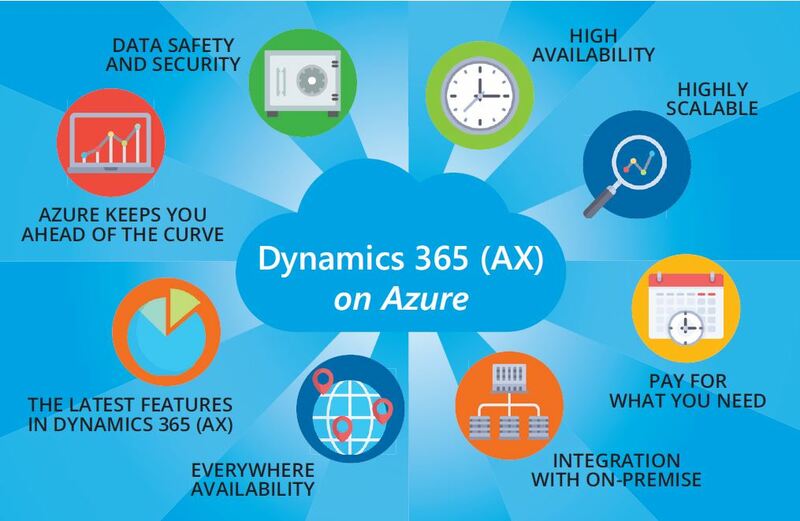 If you’re using Dynamics AX, you know what it has to offer, and it has likely been meeting your needs so far. But if you’re using an on-premises version, you also know you’re missing out on the power of the Cloud. If you’re concerned about the difficulty of an upgrade and a move to the Cloud, don’t be. Managed by a qualified, experienced partner, the process is surprisingly painless, even if your configuration includes multiple integrations with online and on-premises applications or other complexities. Deep IT, ERP, and business expertise. Rather than relying on an internal IT resource that might not know Dynamics AX or have Cloud expertise, you have our consultants, developers, and support staﬀ as your IT team. We are certified in Azure and Dynamics AX/365 and understand the importance of compliance with security and regulatory protocols. Shared knowledge. In addition to designing and implementing your solution, we also bring value-added consulting and education to the table. We want to be your trusted partner, so we work closely with you, sharing our expertise while listening to your needs. A one-stop shop. We don’t just upgrade or move AX; we design and implement a complete system, and we work with your other partners to make sure it all works together. After the implementation, you’ll have one place to call for Dynamics AX, Azure, or other infrastructure issues—you won’t get bounced around between diﬀerent support teams. Unparalleled experience. 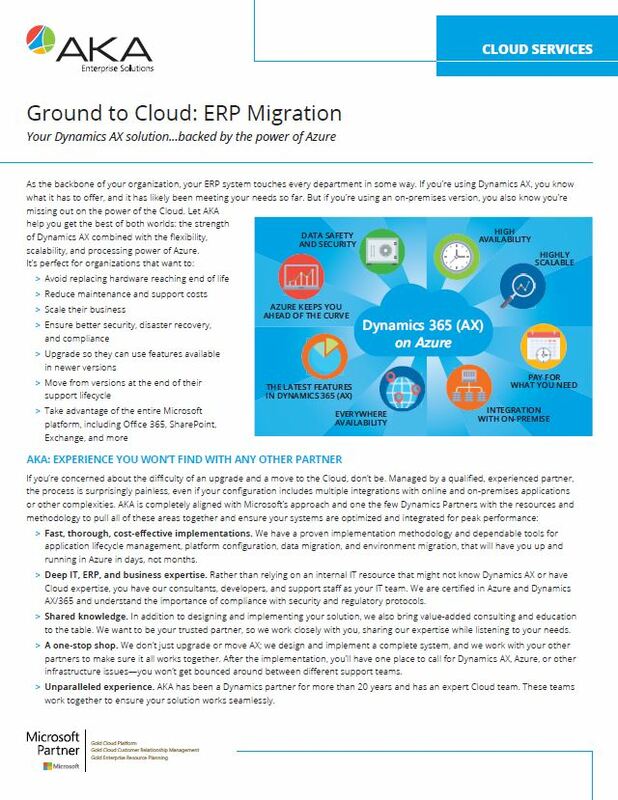 AKA has been a Dynamics partner for more than 20 years and has an expert Cloud team. These teams work together to ensure your solution works seamlessly. High availability—Your data is in a state-of-the-art Microsoft data center with built-in redundancy, so downtime is minimal for updates and maintenance, and backup facilities are staﬀed 24/7. Highly scalable—No more dealing with on-premises infrastructures that are fixed and expensive to expand; Azure allows fast resizing of servers, storage capacity, and build-out of new production and sandbox environments. Pay for what you need—Azure allows you to scale based on demand, so you pay only for what you use. Integration with on-premise systems—Your ERP Cloud environment can be fully integrated with your existing on-premise systems, including CRM, reporting, and third-party applications. Everywhere availability—All your employees need is Internet access to use your applications around the world; Azure runs on a growing global network of Microsoft-managed datacenters. Take advantage of new features and opportunities to optimize—Migrating is the perfect opportunity to upgrade to the latest version of Dynamics so you can take advantage of current features. You also get the opportunity to review and optimize your processes. Azure keeps you ahead of the curve—Use Microsoft PowerApps and Flow to develop low code/no code solutions that run on mobile and desktop platforms and meet your specific needs. You also get access to the latest as Microsoft continues to refine and enhance Azure, Office 365, and Dynamics 365. Data safety and security—Microsoft is equipped to meet ever-changing compliance and regulatory standards for security and authentication, taking the burden oﬀ your staﬀ.